David chose to explore themes from works composed around each centenary year of the cello’s life. At the opening there is a rising gesture, right from the bottom to the top range of the cello, as if rising through history from bass line to treble. The themes take us on a musical journey through the centuries. It’s Ein Heldenleben with the cello as the hero. I chose the title Ein Celloleben by analogy with Strauss’s Ein Heldenleben. 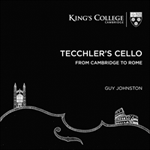 Within its four-minute duration the music encompasses the whole range of the cello from bottom C to a top high G, and passes through moods of contemplation, intense animation and light-hearted scherzando. Towards the end there are three quotations, played very quietly on harmonics: from Corelli’s Christmas Concerto; Beethoven’s E minor piano sonata; and Ravel’s piano trio. There is also a ghostly quotation of the opening of Beethoven’s cello sonata in C.
We recorded this celebratory work at Wigmore Hall, London, and developed some of the ideas during the process. You'll hear some left hand pizzicato during the quotations while I continue to play the upper line with the bow, which was a development made during the recording session itself.